Chelsea midfielder Cesc Fabregas has said that he is open to extending his contract with the west London giants, though the final decision is expected to lie on the club's hierarchy. The Spain international has spent more than four seasons with the Capital outfit but he has found himself phased out under Maurizio Sarri, who has yet to offer him a Premier League appearance. 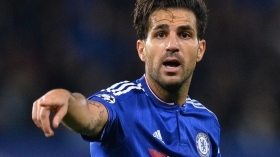 In a report covered by Goal.com, Fabregas admitted that he is keen to prolong his stay beyond the current campaign but has yet to receive assurances that his contract would be extended. "I’m very open about it," he said. "To be the honest the club has not said anything. At the end of the day I have eight months left and at the moment I’m gone. But I’d love to stay at the club." Chelsea have the policy of offering one-year rolling contracts to players aged above 30 but Fabregas is said to be eyeing at least a two-year deal which would take him to the final stages of his career. Aside from Fabregas, the likes of David Luiz, Gary Cahill and Olivier Giroud are in similar positions with respect to their contracts but the club are yet to open discussions with any of them.